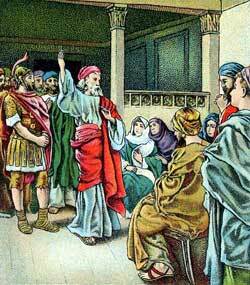 IN THE CITYof Caesarea, about thirty miles north of Joppa, lived a Gentile whose name was Cornelius. This man was an officer in the Roman army, having command of one hundred soldiers. He was called a centurion, but we today would call such an officer a captain. Cornelius, although a Gentile, feared the true God and worshiped him. He also taught his household to serve God instead of idols. And because of his good example some of his soldiers forsook their idols and worshiped the God of the Jews. Cornelius had a kind heart, and he pitied the poor. Often he gave them offerings to help them when they were in distress. And every day he prayed to God as earnestly as did the religious Jews.